After you have selected a card image be sure to fill in the number on your order form. All cards shown on our website are available for use on Memorial Prayer Cards, Memorial Bookmarks, Memorial Pet Cards, Memorial Thank You Notes & Memorial Funeral Programs. The images are watermarked with the MPC seal to protect the copyright of the images.The actual cards do not have the watermark. name under "Image Choice Number" on order form. 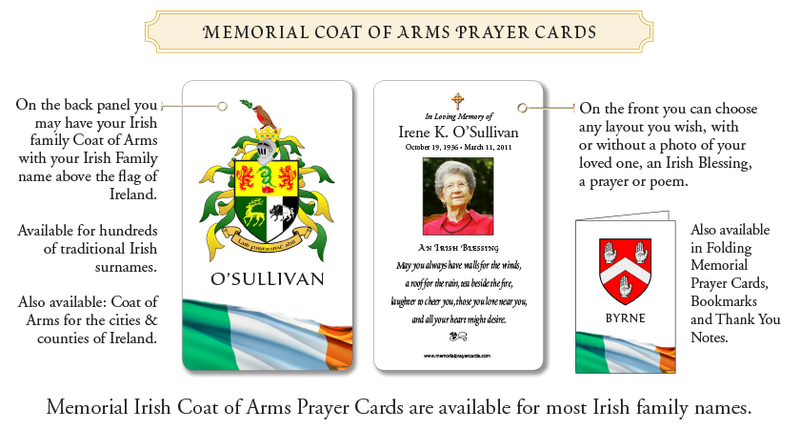 Samples of Irish Memorial Coat of Arms Prayer Cards below. and your family name under "Image Choice Number" on order form.